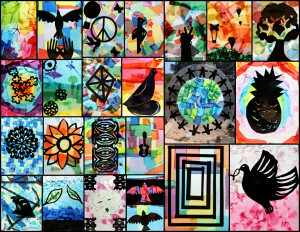 Each year we begin the art program with an exhibit to celebrate International Day of Peace, a tradition that helps establish art as a tool of meaningful expression and one that brings our community together through creativity and thoughtful intention. This tradition began in 2010 and continues on as a wonderful kickstart to our school year. Featured here is the exhibit from 2014, 200 colorful works of art inspired by stained glass. Each student in grades TK–8 had their own window! These works were displayed throughout our school, bringing colorful light into our hallways and classrooms. To prepare for this project, our art classes began with a look back at the history of stained glass and its role as a narrative art form in many different religions. Through our slideshow of various pieces over time, we noticed how stained glass has evolved—in process (how it was made and new techniques that have been invented), in product (how contemporary stained glass looks versus traditional stained glass), and in function (what the role or purpose of stained glass is now). We also touched upon the science of colored glass (how do they DO that?!) and looked at the role of glass in modern art-making. This project was rich with learning and offered a developmentally appropriate challenge for each grade level. For our youngest artists, this project was a perfect entry point to discuss how to use art materials (glue sticks, scissors, etc. ), how to practice the art of collage, and how to look at color theory (what new colors are created when the tissue paper overlaps?). Going up the grade levels, students considered composition, balance and positive/negative space. Our student artists also considered the theme of peace and how they might express this concept through the medium of collage. Students learned the difference between representational art and abstract art. At the middle and upper levels, each student thought deeply about their individual connection to peace and how they might represent this visually.